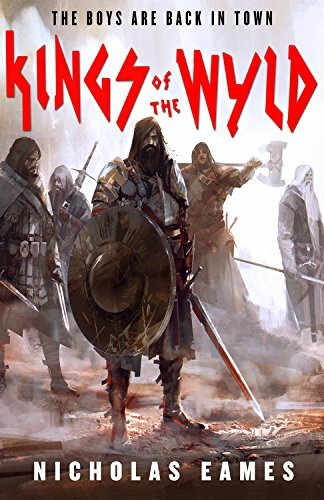 First of all, Kings Of The Wyld is a humorous book, a comedy. It doesn't always take itself too seriously, so aspects that are usually important to me in a fantasy book, like worldbuilding, didn't really matter here. For example, in this world, every creature ever imagined by fantasy authors or mythology exists. In a "serious" fantasy world, this would probably come across as lazy worldbuilding, but here, it works. Just like the equivalence between mercenary bands and rock bands, which is hilarious, only works because of the humorous nature of the book. And the reason it works is that the book is actually funny. Which brings me to my favourite thing about Kings of the Wyld - it's a book full of soul. The narrator tells the story from the point of view of Clay Cooper, and even though it is told in the third person, Clay's personality seems to infuse the narrator's voice, making the prose extremely compelling. There is an ongoing theme about ageing, legacy, and change. The protagonist and his Band all share a glorious past and have trouble adapting to the changing world. Most importantly, they have trouble adapting to their role as "old glories". After all, how do you deal with the thought that your best is already behind you? Just like with the book's main concept, this is handled brilliantly. But it doesn't end here. Every character you meet is interesting and believable. Every place you visit feels textured and lived in. Oh, and funny. You'll always be wearing a smile as you read this book. As for the plot, it's not the most riveting, unpredictable one you've ever read, but it's also not supposed to be. Sure, this is an adventure, but again, it's also a comedy. This is not a book about mind-bending plot twists. It's about brilliant characters and the hilarious world they inhabit. It's heart-warming, somewhat nonsensical fun. Highly recommended if you want a change from your usual epic. A full, hard-rocking five stars from me.